Click here for previous entires in our Montalcino History series. Above: The Fortezza (fortress) in Montalcino. Montalcino lies along the Francigena, the ancient medieval road that led from Rome to France. And it sits near one of the ancient access points to the Maremma on the Tuscan coast and the Tyrrhenian sea. 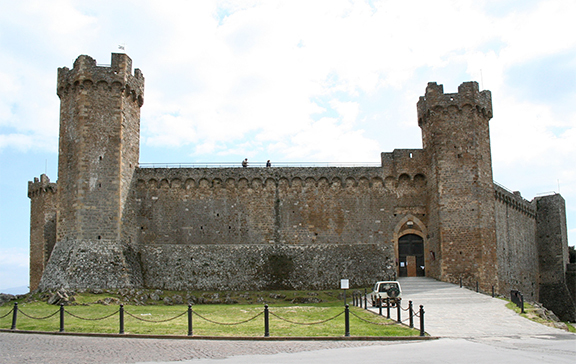 From its very beginning, this made Montalcino both a ideal location for fortification and for commerce on this highly trafficked route. The land here is steep and uneven. And so it great technical expertise and capital were needed to build a city here. For this reason, many believe that such an undertaking must have been conceived at the wealthy and sophisticated Abbey of Sant’Antimo. The steep hill was cleared of its woods and twenty-two terraces were built to accommodate roads, piazzas, buildings, and fields for farming. At one point, more than half of the area within the walls of the township was devoted to farming. Today, these spaces are used as gardens. But in another era, they were an indispensible source of food during sieges and wars. In order to control the best entry point to the city, a castle was constructed. It’s no longer there because it was demolished to make room for the current Fortress (Fortezza). Aerial photography seems to reveal that the design was classic Roman style. There was a north-south cardo that starts at what is today’s Piazza Cavour and leads to Porta Cerbaia. It intersectus with the east-west decumanus, which is harder to discern. It descends from San Salvatore toward Costa Spagni and the Santa Lucia alley and continues toward Fonte Buia. Streets were built relatively large for the era (today’s Via Moglio and Via Cialdini) and four main piazzas were also created: today’s Cavour, Del Popolo, Garibaldi, and Santa Caterina. The earliest churches were dedicated to the patron saints of Montalcino: San Salvatore, which was later turned into a cathedral; Sant’Egidio, where the fourteenth-century Fortezza was later built; and San Michele Arcangelo, today’s church of San Francesco. The faces of the three saints appeared in the city’s device (emblem) before the current holm oak. And when, in the fourteenth century, Montalcino was divided into thirds (as was common practice in medieval urban planning), each setion took the name of one of these saints. Their effigies are depicted in the frescoes in the atrium of the Palazzo Comunale. The city’s walls were already in place by the twelth century. One visitor at the time recounted that it took him an hour and half to walk all the way around the walled city. There were thirteen towers and six gates that presumably took their names from local families: Porta (Gate) Cervara (today’s Cerbaia); Porta della Cornia (today’s Corniolo); Porta della Gattesca (today’s Gattoli), Porta Castellana (whose name has remained unchanged); Porta Morella (today’s Burelli), and Porta Orsini (today’s Cassero). Previous post ← A stunning vertical of Barbi at I Trulli in NYC, one of the greatest wine destination restaurants in the U.S.